OPATIJA, often called the „Nice of the Adriatic“, is one of the most popular tourist resorts in Croatia and a place with the longest tourist tradition on the eastern coast of the Adriatic. In 1844 the powerful merchant Higinio von Scarpa erected Villa Angiolina, with beautiful green and a lavish park around it, visited by distinguished guests - the Croatian Viceroy Josip Jelacic, the Austrian empress Maria Anna - which soon made Opatija a popular excursion destination of the inhabitants from Rijeka, then of the Italians and Austrians. Opatija was the first in the region of the Adriatic to introduce tourist statistics already in 1884, and the first hotel on the Adriatic, called Kvarner, was built by the Society of the Southern Railways in 1884; situated on the very coast and luxuriously furnished, it attracted exclusively elite guests. With the construction of the hotel, Opatija became an elite summer resort, so that, apart from the 12km-long promenade (Lungomare) from Volosko-Opatija-Lovran, a mountain path from Opatija to Veprinac and farther to Ucka was laid. 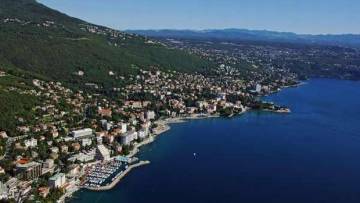 Already in 1889 Opatija was declared the first climatic seaside resort on the Adriatic, which strengthened its position as the most fashionable tourist resort. Numerous tourists and owners of the villas contributed by planting exotic plants to the horticultural grandeur. Opatija was so attractive that, at the end of the 19th and beginning of the 20th centuries, it was visited by the then most prominent personalities of the noble rank - Princess Luise von Sachsen Coburg, the Romanian king Charles I, the Swedish-Norwegian king Oscar, etc. Tourist development is Opatija's main feature even today. Favourable climate, well-maintained landscape, maintained beaches and lively entertainment throughout the year make this place one of the most elite summer resorts in Croatia today. The offer includes 20-odd hotels, a large number of catering establishments, sports and recreational facilities, and especially entertainment opportunities. By the hotel Admiral there is a marina open throughout the year. Very many events in Opatija have a long tradition and offer a high-level entertainment: carnival (January/February), International Yachting Regatta (in May), the Opatija Yachting Cup (in November). Opatija is also a national centre in which Porin, the prize for the best musical pieces is awarded (in March), as well as one of the most important congress centres in Croatia. One of the best restaurants in Croatia is open in Opatija throughout the year.